Patients with primary hypersomnia regularly sleep more than 70 hours per week and have difficulties awakening. When awake, they still have reaction times comparable to someone who has been awake all night. The results are published in the journal Science Translational Medicine. Some members of this patient population appear to have a distinct, disabling sleep disorder called "primary hypersomnia," which is separate from better-known conditions such as sleep apnea or narcolepsy. They regularly sleep more than 70 hours per week and have difficulties awakening. When awake, they still have reaction times comparable to someone who has been awake all night. Their sleepiness often interferes with work or school attendance, and conventional treatments such as stimulants bring little relief. "These individuals report feeling as if they’re walking around in a fog — physically, but not mentally awake," says lead author David Rye, professor of neurology at Emory University School of Medicine and director of research for Emory Healthcare’s Program in Sleep. "When encountering excessive sleepiness in a patient, we typically think it’s caused by an impairment in the brain’s wake systems and treat it with stimulant medications. However, in these patients, the situation is more akin to attempting to drive a car with the parking brake engaged. Our thinking needs to shift from pushing the accelerator harder, to releasing the brake." Flumazenil is usually used in cases of overdose of benzodiazepines, a widely used class of sedatives such as diazepam (Valium) and zolpidem (Ambien). Evidence in the paper suggests that the sleep-inducing substance in patients’ cerebrospinal fluid is not a benzodiazepine drug, even though flumazenil counteracts it. Identifying the mysterious "somnogen", which appears to be produced by the body, could give scientists greater insight into how our brains regulate states of consciousness such as alertness and sleep. "Primary hypersomnias are disabling and poorly understood. This study represents a breakthrough in determining a cause for these disorders and devising a rational approach to therapy. Further research is required to determine whether or not the results apply to the majority of patients," says Merrill Mitler, a program director at the National Institute of Neurological Disorders and Stroke, part of the National Institutes of Health. The team of researchers involved in this effort includes Rye, Andrew Jenkins, assistant professor of anesthesiology, and Kathy Parker, previously at Emory and now at University of Rochester Medical Center. The paper describes how samples of patients’ cerebrospinal fluid (CSF) contain a substance that enhances the effects of the brain chemical GABA (gamma-amino butyric acid). GABA is one of the main inhibitory chemicals of the nervous system — alcohol, barbituates and benzodiazepines all enhance the effects of GABA. In the laboratory, the size of the effect on GABA receptor function is more than twice as large in the hyper-sleepy patients, on average, than in control samples. "In some of the more severely affected patients, we estimated the magnitude of the GABA-enhancing effect as nearly equivalent to that expected for someone receiving sedation for outpatient colonoscopy," Rye says. "This is a level of impaired consciousness that many subjects had to combat on almost a daily basis in order to live their usual lives." The ICSD-2 (International Classification of Sleep Disorders) terms this disorder "primary hypersomnia" and the proposed DSM-V describes it as "major hypersomnolence disorder." Its prevalence is unclear. The Emory team’s findings could potentially provide a biological definition and a treatment for an under-recognized sleep disorder. The patients in the group examined in the paper have received a variety of diagnoses, including idiopathic hypersomnia and narcolepsy without cataplexy. Cataplexy is a sudden loss of muscle tone, sometimes triggered by surprise or strong emotion, characteristic to narcolepsy. Other members of the group are simply considered "long sleepers" (more than 10 hours per day). In addition, the identity of the GABA-enhancing substance is not yet known, although Rye and Jenkins are devising strategies to pin it down. Based on its size and sensitivity to certain enzymes, it could be a peptide, similar to but not the same as the hormones oxytocin or hypocretin. In the laboratory, Jenkins and his colleagues have shown that the sleep-inducing substance can act on GABA receptors that are not sensitive to benzodiazepines. "Previous studies with flumazenil indicate that it does not have a wake-promoting effect on most people, so its ability to normalize vigilance in this subpopulation of extremely sleepy patients appears genuinely novel," Rye says. Other Emory authors include postdoctoral fellows Amanda Freeman and Jacqueline Fairley, data analyst Prabhjyot Saini, Donald Bliwise, professor of neurology, Michael Owens, professor of psychiatry and behavioral sciences, Lynn Marie Trotti, assistant professor of neurology, James Ritchie, professor of pathology and laboratory medicine and Paul Garcia, assistant professor of anesthesiology. D.B. Rye, D.L. Bliwise, K. Parker, L.M. Trotti, P. Saini, J. Fairley, A. Freeman, P.S. Garcia, M.J. Owens, J.C. Ritchie and A. Jenkins. Modulation of vigilance in the primary hypersomnias by endogenous enhancement of GABA(A) receptors. Science Trans. Med 4, 161ra151 (2012). An Atlanta woman came to Emory’s sleep center in 2005. Her sleep requirements – up to 16 hours per day -- gradually increased so much that she needed to take leave of absence from her job. Stimulants (modafinil and amphetamines) prescribed by doctors had a temporary benefit. However, tolerance to these medications required increasing doses that made her uncomfortable, elevated her blood pressure and produced rebound sleepiness, such that she’d sleep for 30 or even 57 hours continuously. Analysis of her CSF revealed biological activity that enhances the effects of GABA. In the laboratory, her CSF’s GABA-enhancing effects were reversible with flumazenil. Based on these results, the Emory team reasoned that flumazenil could form a treatment for the Atlanta woman. She found that it made her feel awake for the first time in years, and long-term treatment with flumazenil has allowed her to return to work. 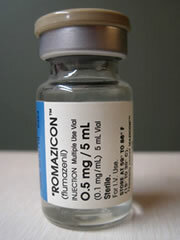 Flumazenil is normally delivered intravenously. Working with manufacturer Roche, Emory investigators, led by Parker, obtained permission from the FDA for long-term sublingual delivery of flumazenil for the Atlanta woman. This success drove Rye and his colleagues to examine CSF samples from other sleep clinic patients, and then to study flumazenil’s effects in a small group of patients with similar symptoms.